The Most Holy Trinity: "I have much more to tell you, but you cannot bear it now." But when he comes, the Spirit of truth, he will guide you to all truth. He will not speak on his own, and will declare to you the things that are coming. He will glorify me, because he will take from what is mine and declare it to you. Everything that the Father has is mine;for this reason I told you that he will take from what is mine and declare it to you." The Trinity is a mystery of faith in the strict sense, one of the "mysteries that are hidden in God, which can never be known unless they are revealed by God". To be sure, God has left traces of his Trinitarian being in his work of creation and in his Revelation throughout the Old Testament. But his inmost Being as Holy Trinity is a mystery that is inaccessible to reason alone or even to Israel's faith before the Incarnation of God's Son and the sending of the Holy Spirit. The Trinity is One. 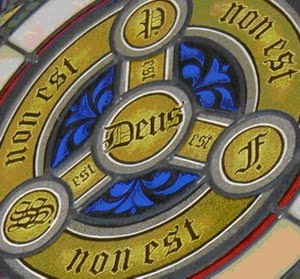 We do not confess three Gods, but one God in three persons, the "consubstantial Trinity". The divine persons do not share the one divinity among themselves but each of them is God whole and entire: "The Father is that which the Son is, the Son that which the Father is, the Father and the Son that which the Holy Spirit is, i.e. by nature one God." In the words of the Fourth Lateran Council (1215), "Each of the persons is that supreme reality, viz., the divine substance, essence or nature." Saturday, Ord Time Wk 8: "On those who waver, have mercy"
... save others by snatching them out of the fire; on others have mercy with fear, abhorring even the outer garment stained by the flesh. Friday, Ord Time Wk 8: "The end of all things is at hand"
Therefore be serious and sober-minded so that you will be able to pray. Remember also your Creator in the days of your youth, . . . before the dust returns to the earth as it was, and the spirit returns to God who gave it. Thursday, Ord Time Wk 8: "like living stones, let yourselves be built"
into a spiritual house to be a holy priesthood to offer spiritual sacrifices acceptable to God through Jesus Christ. Mother Church earnestly desires that all the faithful should be led to that full, conscious, and active participation in liturgical celebrations which is demanded by the very nature of the liturgy, and to which the Christian people, "a chosen race, a royal priesthood, a holy nation, a redeemed people," have a right and an obligation by reason of their Baptism. S Philip Neri: "Realize that you were ransomed from your futile conduct"
... handed on by your ancestors, not with perishable things like silver or gold but with the precious Blood of Christ as of a spotless unblemished Lamb. Consequently, St. Peter can formulate the apostolic faith in the divine plan of salvation in this way: "You were ransomed from the futile ways inherited from your fathers... with the precious blood of Christ, like that of a lamb without blemish or spot. He was destined before the foundation of the world but was made manifest at the end of the times for your sake." Man's sins, following on original sin, are punishable by death. By sending his own Son in the form of a slave, in the form of a fallen humanity, on account of sin, God "made him to be sin who knew no sin, so that in him we might become the righteousness of God." Tuesday, Ord Time Wk 8: The prophets "were serving not themselves but you"
... with regard to the things that have now been announced to you by those who preached the Good News to you through the Holy Spirit sent from heaven, things into which angels longed to look. Monday, Ord Time Wk 8: "Blessed be the God and Father of our Lord Jesus Christ"
The Paschal mystery has two aspects: by his death, Christ liberates us from sin; by his Resurrection, he opens for us the way to a new life. This new life is above all justification that reinstates us in God's grace, "so that as Christ was raised from the dead by the glory of the Father, we too might walk in newness of life." Justification consists in both victory over the death caused by sin and a new participation in grace. It brings about filial adoption so that men become Christ's brethren, as Jesus himself called his disciples after his Resurrection: "Go and tell my brethren." We are brethren not by nature, but by the gift of grace, because that adoptive filiation gains us a real share in the life of the only Son, which was fully revealed in his Resurrection. Saint Desiderius, pray for us. The passion of Saint Desiderius from among the Lingones in Lyons, Gaul, a bishop, who, as it is told, when he perceived that his people were being harassed by Vandals, approached their king in order to plead on his people�s behalf; wherefore, ordered at once to be slain, willingly offered himself for the sake of the sheep entrusted to him. Saturday, Easter Wk 7: "the Romans wanted to release me"
... because they found nothing against me deserving the death penalty.But when the Jews objected, I was obliged to appeal to Caesar, even though I had no accusation to make against my own nation. If, however, non-lethal means are sufficient to defend and protect people's safety from the aggressor, authority will limit itself to such means, as these are more in keeping with the concrete conditions of the common good and are more in conformity to the dignity of the human person. Today, in fact, as a consequence of the possibilities which the state has for effectively preventing crime, by rendering one who has committed an offense incapable of doing harm - without definitely taking away from him the possibility of redeeming himself - the cases in which the execution of the offender is an absolute necessity "are very rare, if not practically non-existent." S Rita of Cascia, religious, pray for us. Friday, Easter Wk 7: "the Jews brought charges against Paul"
... and demanded his condemnation. I answered them that it was not Roman practice to hand over an accused person before he has faced his accusers and had the opportunity to defend himself against their charge. False witness and perjury. When it is made publicly, a statement contrary to the truth takes on a particular gravity. In court it becomes false witness. When it is under oath, it is perjury. Acts such as these contribute to condemnation of the innocent, exoneration of the guilty, or the increased punishment of the accused. They gravely compromise the exercise of justice and the fairness of judicial decisions. Saint Christopher Magallanes, priest and martyr, and his companions, martyrs, pray for us. Thursday, Easter Wk 7: "I am on trial"
for hope in the resurrection of the dead. Saints Bernardine of Siena, pray for us. Wednesday, Easter Wk 7: "by hard work...we must help the weak"
"... and keep in mind the words of the Lord Jesus who himself said, 'It is more blessed to give than to receive.' " When he had finished speaking he knelt down and prayed with them all. 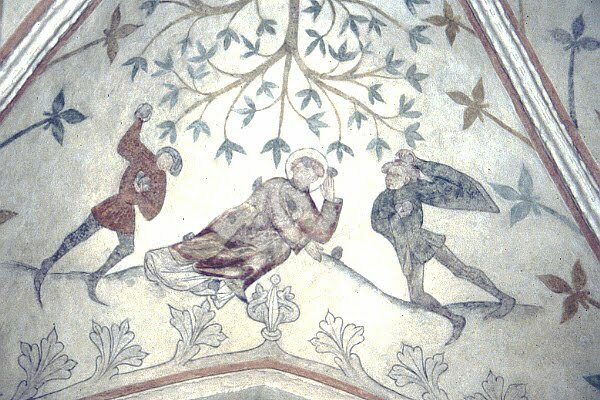 They were all weeping loudly as they threw their arms around Paul and kissed him, for they were deeply distressed that he had said that they would never see his face again. The first Christian communities lived this form of fellowship intensely. Thus the Apostle Paul gives them a share in his ministry of preaching the Gospel but also intercedes for them. The intercession of Christians recognizes no boundaries: "for all men, for kings and all who are in high positions," for persecutors, for the salvation of those who reject the Gospel. Tuesday, Easter Wk 7: "Paul had the presbyters of the Church at Ephesus summoned"
Monday, Easter Wk 7: "Paul laid his hands on them"
... the Holy Spirit came upon them, and they spoke in tongues and prophesied. Saturday, Ascensiontide: Apollos "began to speak boldly in the synagogue"
but when Priscilla and Aquila heard him,they took him aside and explained to him the Way of God more accurately. - an ecclesial catechesis, for it is through the manifold exchanges of "spiritual goods" in the "communion of saints" that Christian life can grow, develop, and be communicated. Saint Isidore the Farmer, pray for us. Our Lady of Fatima in Ascensiontide : "A little while and you will no longer see me"
and again a little while later and you will see me. Christ's Ascension marks the definitive entrance of Jesus' humanity into God's heavenly domain, whence he will come again (cf. Acts 1:11); this humanity in the meantime hides him from the eyes of men (cf. Col 3:3). “Believe in the Lord Jesus and you and your household will be saved.” So they spoke the word of the Lord to him and to everyone in his house. He took them in at that hour of the night and bathed their wounds; then he and all his family were baptized at once. From the very day of Pentecost the Church has celebrated and administered holy Baptism. Indeed St. Peter declares to the crowd astounded by his preaching: "Repent, and be baptized every one of you in the name of Jesus Christ for the forgiveness of your sins; and you shall receive the gift of the Holy Spirit." The apostles and their collaborators offer Baptism to anyone who believed in Jesus: Jews, the God-fearing, pagans. Always, Baptism is seen as connected with faith: "Believe in the Lord Jesus, and you will be saved, you and your household," St. Paul declared to his jailer in Philippi. And the narrative continues, the jailer "was baptized at once, with all his family." Sixth Sunday of Easter: "Keep my word"
“I have told you this while I am with you. The Advocate, the Holy Spirit, whom the Father will send in my name, will teach you everything and remind you of all that I told you." God is the author of Sacred Scripture. "The divinely revealed realities, which are contained and presented in the text of Sacred Scripture, have been written down under the inspiration of the Holy Spirit." "For Holy Mother Church, relying on the faith of the apostolic age, accepts as sacred and canonical the books of the Old and the New Testaments, whole and entire, with all their parts, on the grounds that, written under the inspiration of the Holy Spirit, they have God as their author, and have been handed on as such to the Church herself." Before his Passover, Jesus announced the sending of "another Paraclete" (Advocate), the Holy Spirit. At work since creation, having previously "spoken through the prophets", the Spirit will now be with and in the disciples, to teach them and guide them "into all the truth". The Holy Spirit is thus revealed as another divine person with Jesus and the Father. The Spirit and the Church cooperate to manifest Christ and his work of salvation in the liturgy. Primarily in the Eucharist, and by analogy in the other sacraments, the liturgy is the memorial of the mystery of salvation. The Holy Spirit is the Church's living memory. On the day of Pentecost, the Spirit of the Promise was poured out on the disciples, gathered "together in one place." While awaiting the Spirit, "all these with one accord devoted themselves to prayer." The Spirit who teaches the Church and recalls for her everything that Jesus said was also to form her in the life of prayer. Saturday, Easter Wk 5: "the world would love its own"
... but because you do not belong to the world, and I have chosen you out of the world, the world hates you. Though already present in his Church, Christ's reign is nevertheless yet to be fulfilled "with power and great glory" by the King's return to earth. This reign is still under attack by the evil powers, even though they have been defeated definitively by Christ's Passover. Until everything is subject to him, "until there be realized new heavens and a new earth in which justice dwells, the pilgrim Church, in her sacraments and institutions, which belong to this present age, carries the mark of this world which will pass, and she herself takes her place among the creatures which groan and travail yet and await the revelation of the sons of God." That is why Christians pray, above all in the Eucharist, to hasten Christ's return by saying to him: Marana tha! "Our Lord, come!" Friday, Easter Wk 5: "You are my friends"
... if you do what I command you. I no longer call you slaves, because a slave does not know what his master is doing. I have called you friends, because I have told you everything I have heard from my Father. 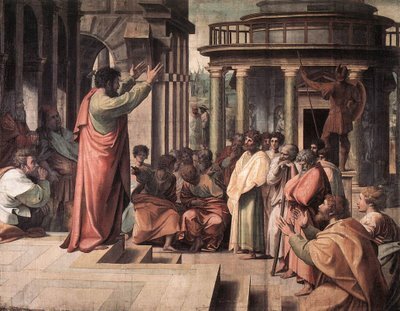 Thursday, Easter Wk 5: "After much debate had taken place, Peter got up"
... and said to the Apostles and the presbyters,“My brothers, you are well aware that from early days God made his choice among you that through my mouth the Gentiles would hear the word of the Gospel and believe. Helped by the priests, their co-workers, and by the deacons, the bishops have the duty of authentically teaching the faith, celebrating divine worship, above all the Eucharist, and guiding their Churches as true pastors. Their responsibility also includes concern for all the Churches, with and under the Pope. "The college of bishops exercises power over the universal Church in a solemn manner in an ecumenical council." 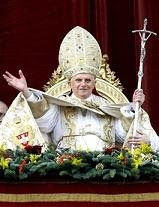 But "there never is an ecumenical council which is not confirmed or at least recognized as such by Peter's successor." Photo: Second Vatican Council, Basilica of San Pietro, Roma. Tuesday, Easter Wk 5: "They stoned Paul and dragged him out of the city, supposing that he was dead." After they had proclaimed the good news to that city and made a considerable number of disciples, they returned to Lystra and to Iconium and to Antioch.They strengthened the spirits of the disciples and exhorted them to persevere in the faith, saying, "It is necessary for us to undergo many hardships to enter the kingdom of God. "They appointed presbyters for them in each church and, with prayer and fasting, commended them to the Lord in whom they had put their faith. They appointed elders for them in each church and, with prayer and fasting, commended them to the Lord in whom they had put their faith. 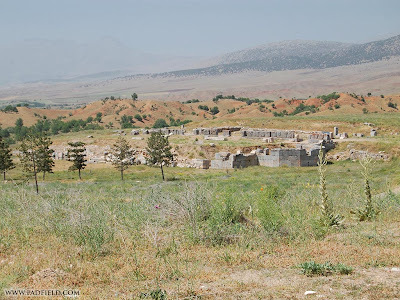 Then they traveled through Pisidia and reached Pamphylia. After proclaiming the word at Perga they went down to Attalia. From there they sailed to Antioch, where they had been commended to the grace of God for the work they had now accomplished. And when they arrived, they called the church together and reported what God had done with them and how he had opened the door of faith to the Gentiles. "Hence the laity, dedicated as they are to Christ and anointed by the Holy Spirit, are marvelously called and prepared so that even richer fruits of the Spirit maybe produced in them. For all their works, prayers, and apostolic undertakings, family and married life, daily work, relaxation of mind and body, if they are accomplished in the Spirit - indeed even the hardships of life if patiently born - all these become spiritual sacrifices acceptable to God through Jesus Christ. In the celebration of the Eucharist these may most fittingly be offered to the Father along with the body of the Lord. And so, worshipping everywhere by their holy actions, the laity consecrate the world itself to God, everywhere offering worship by the holiness of their lives." Additional reflection on today's Scriptures available here. 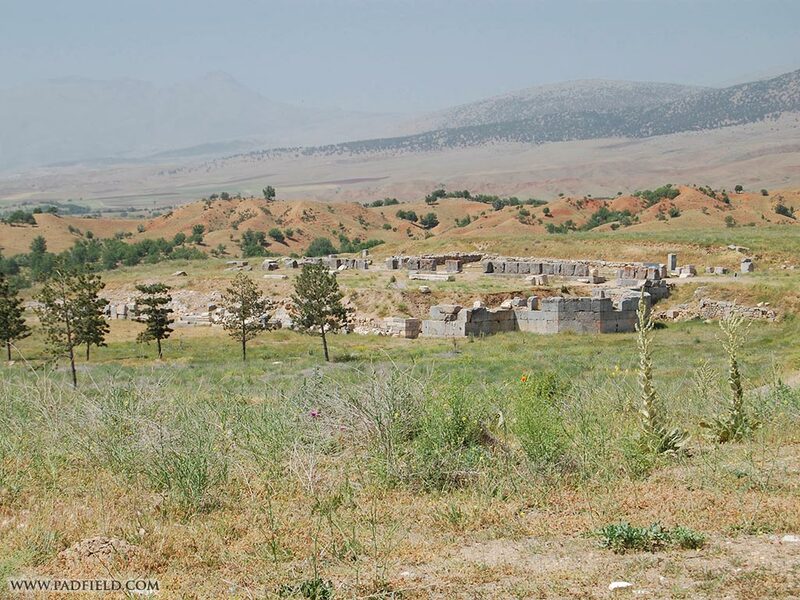 Photo: Church of Saint Paul, Pisidian Antioch.